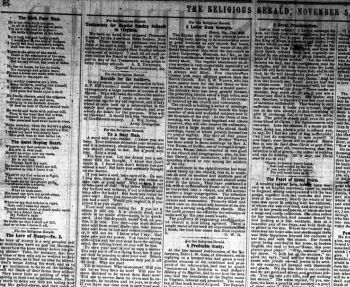 Southern Baptist newspaper editors in the post-war months find much to criticize about the religious newspapers of the North. Pretending surprise of “the degree in which the religious papers of the North are devoted to politics,” the writer is silent on the overtly political nature of the Southern Baptist press during the war years. Perhaps the editor is counting on his white Southern readers having already forgotten that during the entirety of the war, the Southern Baptist press spent an inordinate amount of ink on political essays, editorials, commentaries and news items. Or perhaps there is a tacit agreement among white Southern Baptists to forget altogether certain of their actions and words during the war. Selective amnesia, one might say. The feigning of ignorance of their own past, however, serves the purpose of helping create a mythology of the recent past, a mythology that turns the white Confederacy’s destruction into a righteous ideological victory. Truth be ignored, honesty be damned, and self-righteous ignorance glorified.